Antoni Llueca, Jose Luis Herraiz, Yasmine Maazouzi, Dolors Piquer. Unit for Abdomino-Pelvic Oncology Surgery (MUAPOS), University General Hospital of Castellon; Department of Medicine, University Jaume I (UJI), Castellon, Spain. 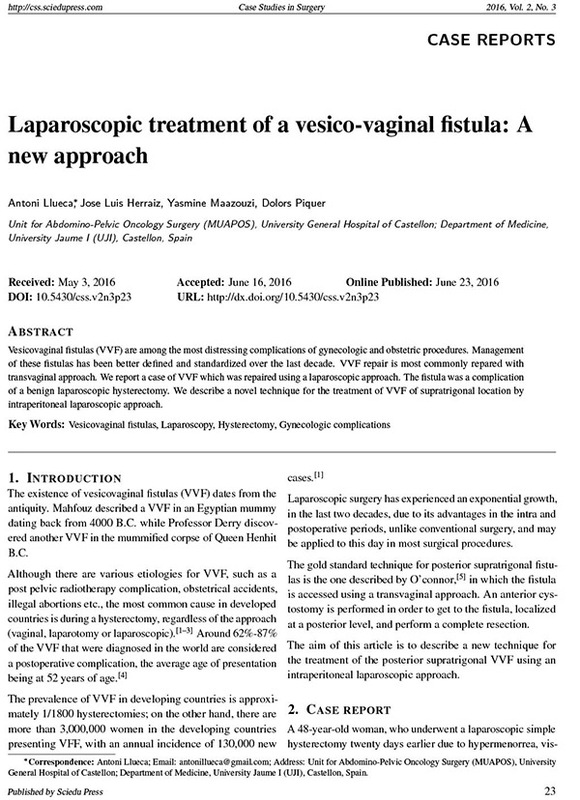 Vesicovaginal fistulas (VVF) are among the most distressing complications of gynecologic and obstetric procedures. Management of these fistulas has been better defined and standardized over the last decade. VVF repair is most commonly repared with transvaginal approach. We report a case of VVF which was repaired using a laparoscopic approach. The fistula was a complication of a benign laparoscopic hysterectomy. We describe a novel technique for the treatment of VVF of supratrigonal location by intraperitoneal laparoscopic approach.